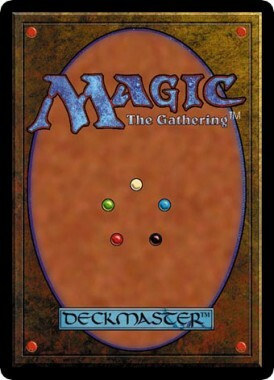 The standard Magic card back. Its design is meant to resemble the cover of a Spell Book. Magic: The Gathering is a Collectible Card Game, produced in 1993 by Wizards of the Coast (eventually the owners of that other great geek game, Dungeons & Dragons). It was the first true Collectible Card Gamenote previous attempts mostly involved baseball cards, the Genre Popularizer, and even today it is one of the most popular card games in the world. The Mana system: To cast spells, players need the correct amount and color of mana. Mana is gained from Land cards... but you can only play one Land per turn. At a stroke, this brings the Awesome, but Impractical and Limited Move Arsenal tropes into the game (more powerful spells cost lots of mana, and decks with too many colors risk drawing the wrong lands and being unable to play their current hand of spells). For a more complete analysis of gameplay (which is, of course, the heart of any game), we wrote a Useful Notes page for your enjoyment. Magic: The Gathering: A 1997 Card Battle Game by MicroProse. It contained both a free-dueling mode, allowing you to build decks and battle them against AI opponents, and a campaign mode, where you could travel across the land of Shandalar exploring, dueling enemies, collecting cards, and eventually battling a Big Bad. Notable in that when the game was in Development Hell, Sid Meier was brought in to give it more focus. Magic: The Gathering Online: released in '02, it was the first official way to play the game over the Internet. It has garnered a fair bit of revenue over the years, especially since Wizards offer (very limited) ways to convert digital cards into physical ones and vice versa. Duels Of The Planeswalkers: A more modern adaptation available on The PlayStation Store, Xbox Live Arcade and Steam, originally released in 2009. It has received Numbered Sequels in summer of each succeeding year, coinciding with new Core Set releases, and Wizards are deliberately positioning it as their Gateway Series to new players. Magic Duels: Wizards eventually stopped releasing yearly sequels, in favor of a single Free To Play game that receives regular updates, usually with new cards and story missions. Unlike a lot of other Free To Play card games, purchasing packs in Magic Duels will always give you new cards. Once you have four of a card (the max allowable in a deck), it is removed from the card pool. Otherwise, it is very similar to the other Duels games. Magic: The Gathering Arena: On July 2017, Wizards announced that they would no longer update Magic Duels in preparation for a new Free To Play game named Magic: The Gathering Arena. It appears to take a lot of cues from Hearthstone: Heroes of Warcraft in terms of visual styling. Magic The Gathering Tactics: A 2011 Turn-Based Strategy for PC and PlayStation 3 inspired by Magic. The gameplay bears little to no resemblance to the original card game, but the flavor of it is retained. An, as-of-yet unnamed, MMORPG by Cryptic Studios (creators of Neverwinter and Star Trek Online) which, like Tactics, is only using the lore of the MtG multiverse for its foundations. The official Magic website can be found here . Additionally, the pages for individual Magic novels and comics can be found here.